Turn your beach daydream into a reality. Southwest Vacations® offers both domestic and international beach destinations where you can soak up the sun and play in the surf. Escape to the tropics of the Caribbean and Mexico or discover the beautiful beaches found up and down the Florida and California coastlines. In Cancun, it's all about the beach. This popular destination is famous for its abundance of luxurious all-inclusive resorts offering top-notch amenities and their own stretch of beachy paradise. Cancun's Hotel Zone is the life of the party with an exciting nightlife scene, side-by-side resorts lining the beaches, and plenty of entertainment and shopping options. Riviera Maya is home to 75 miles of pristine beaches stretching down the coastline from Cancun through the city of Playa del Carmen to the famous Mayan ruins near Tulum—appealing to travelers looking for a secluded experience with more distance between resorts. Lush and tropical beaches are the norm in Jamaica. Expect to be impressed by the bright blue waters and white sandy beaches. Take the plunge and discover the beauty underneath the surface with Jamaica’s many signature snorkeling and dive sites. Montego Bay is a hub for vacationers due to an abundance of beachfront all-inclusive resorts, charming British colonial architecture and the convenience of an international airport. Negril is famous for the Seven Mile Beach on the island’s western coast, while Ocho Rios on the north coast has a bustling cruise port and an extensive bay surrounded by lush rainforest. With great year-round warm weather and miles of tropical beaches to choose from, Punta Cana is a great choice for a Caribbean beach vacation. Beachgoers will appreciate the super soft sand, shallow waters, and unique natural pools, perfect for a relaxing dip in the warm water. Bavaro Beach is one of the most popular beaches lined with resorts, restaurants, and shops where you can buy souvenirs and sign up for fun activities and excursions. Watersports are central to Punta Cana culture, featuring offshore reef snorkeling, deep sea diving, and most popular windsurfing. The city of Tampa is the downtown core for the entire Tampa Bay region, one of Florida’s top beach destinations. Gorgeous Gulf sunsets, unique cultural heritage, vast sporting and recreational activities, fresh seafood, and great shopping are all available. The stand-out attraction that brings most visitors to Tampa is Busch Gardens, a 300-acre entertainment park combining a world class zoo along with eye popping roller coaster rides. Visit the best of Tampa’s attractions while enjoying great views of the water with a stroll along the Tampa Riverwalk. This downtown pedestrian area connects multiple parks and is close to many of Tampa’s best attractions including the Florida Aquarium, Tampa Convention Center, Glazer Children’s Museum and the Tampa Bay History Center. While most of the top beaches in the area are located on the Gulf Coast throughout St. Petersburg and Clearwater, downtown Tampa offers a few beaches along the bay. Ben T. Davis Beach is popular for sunsets, volleyball, and is very close to the airport. Davis Islands offers a dog beach, stand-up paddle boarding (SUP), and a marina full of boats. St. Petersburg, also known as The Sunshine City, is a vibrant Florida beach destination located along the shores of Tampa Bay with numerous water activities, dining, and entertainment. Plus, it’s within walking distance to all the white sandy beaches along the Gulf of Mexico. The beaches of St. Petersburg stretch from Fort DeSoto in the south through numerous beach communities up the coast up to Clearwater. Escape to the wild beaches of Egmont Key State Park, located at the mouth of Tampa Bay south of St. Petersburg. This beautiful, remote island is only accessible by boat and ferry and features miles of untouched beaches, a lighthouse, and a wildlife refuge. Located west of the city of Tampa, across Old Tampa Bay, is the beautiful beach community of Clearwater. This year-round beach destination offers calm waters, sugary soft sand, clear warm water, and miles of inviting beaches along the Gulf of Mexico. Clearwater Beach stretches for three miles along a thin barrier island home to private residences, resorts, restaurants, and enough amenities that you won’t have to stray too far from the beach. Caladesi Island State Park has one of Florida’s top-rated beaches and is located on an island just north of Clearwater Beach. Located along the Atlantic (east) Coast of the South Florida region Ft. Lauderdale is a can't miss beach location. Fort Lauderdale is also known as the "Venice of America" for its many canals. In downtown Fort Lauderdale you can visit the enjoyable Museum of Discovery and Science or stroll along the beautiful and scenic Riverwalk. The award-winning Wave Wall and signature beachfront Promenade highlight Ft. Lauderdale’s coastline. 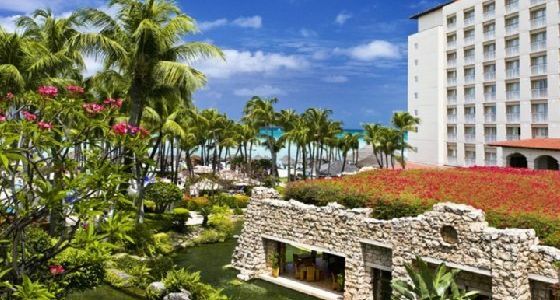 Aruba has an exquisite landscape and consistently-beautiful weather, but the typical vacationer visits for the beaches because they are nothing short of Caribbean paradise. Enjoy calm turquoise water and long stretches of white sandy beaches dotted with picture-perfect palm trees and signature leaning divi-divi trees. Aruba offers a variety of beaches. From the resort area’s busy beaches with all the amenities you’ll need to rugged beaches found in more isolated areas around the island, you can create your own experience. Aruba is one of the leading snorkeling and dive site destinations in the Caribbean with great options for all skill levels, not to mention the thrill of exploring sunken ships.